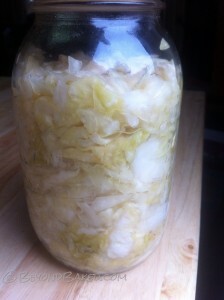 This kraut is easy, delicious and super healthy. I make my own raw milk kefir and with that I make yogurt so I always have leftover whey. Whey is so versatile, it can be used in breads, pizza crusts, pancakes, etc. Whey can also be used to ferment vegetables and soak grains. This recipe is based on Sally Fallon’s from the book Nourishing traditions, the only difference is she uses caraway seeds and I did not. This is now my base recipe to which I will try adding differnet flavors including caraway seeds. Let me know what your favorite kraut additions are!!! Wash, dry and chop your cabbage. In a large bowl mix the cabbage with the salt well with your hands. Taste the cabbage, it should be salty. If not add a bit more. Next pound the cabbage with meat hammer or other pounder until it is tender and starting to get juicy. Stuff it all into a quart jar very tightly packed. Leave at least an inch between the kraut and the lid. Close lid tightly and leave it out on the counter out of the sun for 3 days. Refrigerate. It’s done now but will get better with time. Wash, dry and chop your cabbage. In a large bowl mix the cabbage with the salt well with your hands. Taste the cabbage, it should be salty. Next pound the cabbage with meat hammer or other pounder until it is tender and starting to get juicy. Stuff it all into a quart jar very tightly packed. Leave at least an inch between the kraut and the lid. Close lid tightly and leave it out on the counter out of the sun for 3 days. Refrigerate. It’s done now but will get better with time.